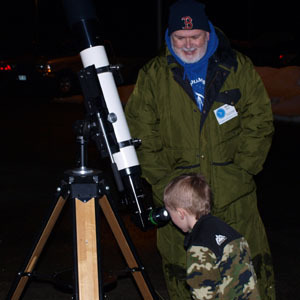 A "Skywatch" is simply a gathering of amateur astronomers with a focus on outreach and education for a private group or for the public at large. A Skywatch is by definition "beginner-friendly." 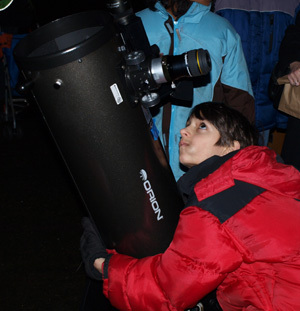 At a skywatch our focus is on giving you and your group the most enjoyable and educational experience possible! Our members will arrive before sunset, set up their equipment and choose their celestial targets with public education and outreach in mind. An educational slide presentation may also preceed the skywatch if a suitable venue is available. We try to work with the requesting organization to schedule these events at locations where streetlights are not visible since you can see more deep sky objects like galaxies under these conditions. However, the Moon and planets still make wonderful targets in more light-polluted areas. On nights when the Moon is visible we try to schedule events around the first quarter moon (as opposed to full moon) because the low sun angle on the moon around first quarter allows Lunar craters and mountains to be seen in much more pleasing detail. Solar observing with special filters is also possible during the day, but use caution and never look through any kind of telescope (even a small one) at the sun without proper filters. Delicate Equipment – Use Care! The equipment (telescopes and binoculars) through which you will be observing is the property of the member who is operating the equipment. It represents a considerable investment of time and money. The equipment is designed to be sturdy but contains many delicate parts. It will be carefully aligned for you on an interesting celestial target, and small motors may be keeping it pointed squarely at the object. Please don’t push on it, or touch any part of the telescope unless you are specifically encouraged to do so, and never touch anything made of glass (like an eyepiece) or anything having a mirrored surface. Your observer will give you a quick overview of what you will be seeing, and the telescope’s focus knob will usually be pointed out for you. If it is not, just ask "May I focus this if needed?" Only slight adjustments to the focus are usually necessary, but since everyone’s eyes are different please adjust the focus until you see the best possible image. You may observe with or without glasses, but try it without. The telescope’s focusing mechanism can adapt to most near- and far-sighted people, and with your eye that much closer to the eyepiece you will see a wider field of view. If an observing chair is available, do sit down and make yourself comfortable before placing your eye to the eyepiece. If you observe bent over so your back or neck are giving you pain, you will not be able to relax and enjoy the view. Many celestial objects, while beautiful, are quite dim and it may take some time before you begin to see all the detail. Atmospheric turbulence may also come and go, so you may suddenly experience moments when the view is spectacularly better – watch for them! This is your special time at the telescope so we encourage you to make the most of it. Do ask any questions that come to mind, and if you don’t see anything please say “I don’t see anything!” since objects do sometimes drift out of view. Be especially careful of wires on the ground. Try to park so that your headlights and back-up lights won’t interfere with the observers. No white lights. A red light will not ruin your night vision as much as white light will. You can cover the lens of a regular light with red plastic or tail-light repair tape. A dim light will seem bright once your eyes become dark-adapted. The bright flash of a camera can wreck everyone's night vision. Few people realize just how chilly it gets late at night, even in summer, particularly when you are standing still under a clear sky. Bring about twice as much warm clothing as you think you'll need. In summer, a light and heavy jacket, warm shirt, jeans. Winter calls for insulated boots, thermal underwear, corduroy jeans, parka, flannel shirt, gloves, and, very important, a warm knit cap!